After our busy Saturday in sunny San Diego, I was pretty tired waking up Sunday. We had a little breakfast in our hotel room and then decided to check out a local church that had been recommended to us by a friend of ours with California roots. I also had a friend who went to The Rock Church back when he was in college and I was visiting San Diego for the first time. He loved it so we gave it a try. I remembered the “old” Rock Church that met in an elementary school auditorium. I was shocked when we pulled up to a huge building and long lines to get a parking space. There were hundreds of people walking toward the main building and I started to get a little excited. It was so cool to know that God has grown this church so tremendously! Once we found a parking spot (near the back of the lot because we needed space for “the beast”), we headed down the street to the church. You could feel the eagerness and joy of the congregation walking toward the entrance. Once inside, we were in a very dark, very large auditorium with three levels of seating. The first two levels were already almost packed even though the service had only started 3-4 minutes earlier. We found some seats and stayed standing for worship. They sang the same songs our home church sings, and the musicians played them the same way, but there was a different sense of intensity and passion. These people were free to raise their hands and sing loud. Our home church is way more reserved and I’ve always hated it. I don’t know if it’s just my own perspective or if it’s really the norm for our church culture, but it’s usually not normal to let lose during worship, to raise hands freely, to shout, and dance. Some people do, but they seen as hyper-passionate and maybe just a bit nuts. There in the dark, singing “my God is might to save”, and “praise the one who paid my debt and raised this life up from the dead”, I found severe joy. I had failed in so many ways: I lost my job, couldn’t complete my 35 workout commitment, struggled once again with binge eating and flirted with depression. But the truth had never been so clear – God had saved me already, and would continue to save me. I could trust him and have joy despite my circumstances. The rest of the service was nearly as good. The message was solid, and I loved that they always knelt to pray and that there was a call to prayer at the end of the service. These people know that there is strength in weakness and power in prayer. I don’t know that I live in that reality even on Sunday mornings. It was definitely refreshing and I’m so glad that we made time for church on vacation. On to the less sappy stuff: After church we headed to one of our favorite places in San Diego, Old Town. It’s a neighborhood/tourist attraction that looks like a early Spanish colony. 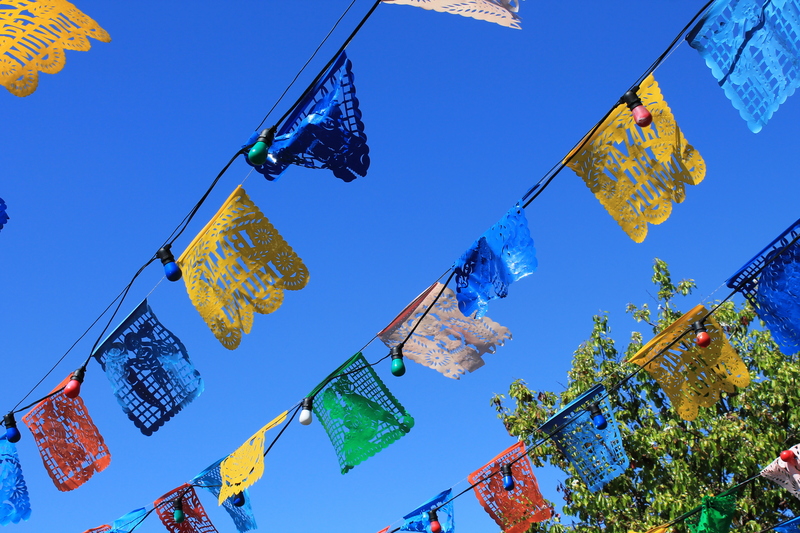 Tons of cute stucco and adobe shops decorated with brightly colored flags line several streets. 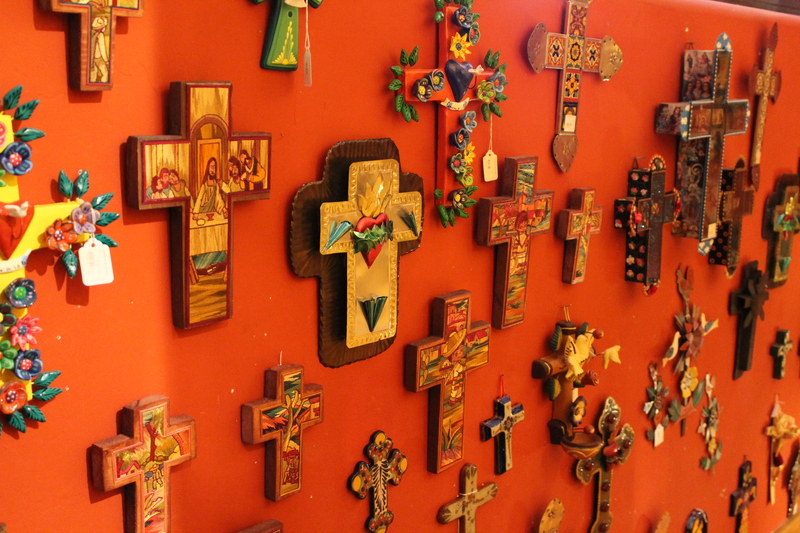 There’s a park where mariachi’s play, and a few hidden souvenir shops flea markets. We ate at a busy Mexican restaurant (over rated), then did a little shopping. 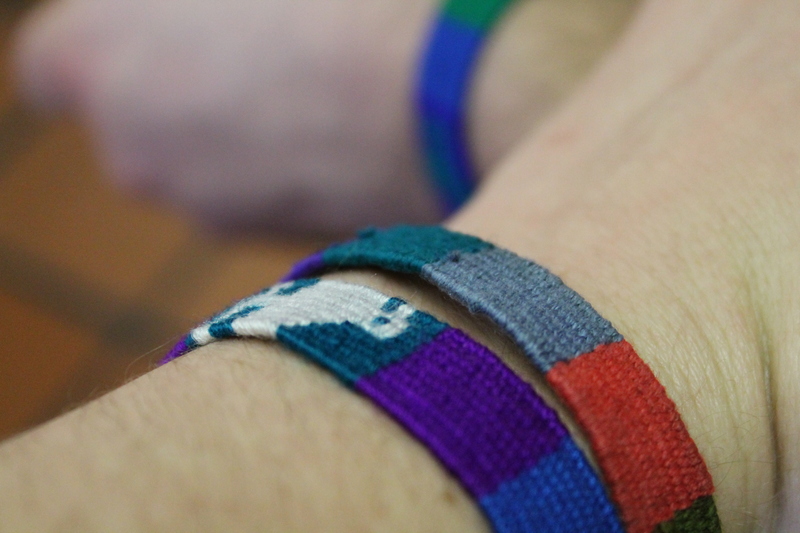 We had bought friendship bracelets at a South America Imports store while on our Honeymoon in San Diego last year, so we each bought another this year. This time we got matching chickens. I just happened to be wearing my bracelet from last year too! After our trip to Old Town, we went back to our hotel and grabbed our beach blanket and headed down to watch the sun set. Even with clouds, it was beautiful. Here’s the part we were really looking forward to: AMC Theater La Jolla. They have reclining theater seats, a restaurant and a bar. We were pumped! We had snacked on crackers and leftovers for dinner, so we stopped and smuggled some candy into the theater, although it would’ve been cool to take advantage of the theater amenities. So get this, we were able to reserve our seats when we bought our tickets online. We got the best ones in the theater and they were still open when we got there. There wasn’t anyone really checking for seat reservations, but I’m sure we could’ve booted someone out by showing them our stubs. We saw the only decent looking movie playing at 9:20 on a Sunday night – Lego Movie. It was hilarious. The parts of it I caught at least. The seats were so comfy and the theater was so warm (because when it’s 60 degrees out Californians crank the furnace up) that I found myself dosing off a few times. I still enjoyed myself. It’d be great to have a theater like this near us; I’d have to go to earlier shows though to stay awake! Putting your feet up is encouraged at La Jolla’s AMC theater! After the movie, we basically went back to the hotel and crashed. Two jam packed days and we were just exhausted. Probably a little jet lagged too. When our movie got out at 11:30 California time, it was 1:30 Chicago time. Way past my bedtime! The next day would be our last day and it was just as good as the first two. Stop by tomorrow for the thrilling conclusion to this three part vacation recap saga!